It’s not white, but it’s pretty close. And it’s really going to cheer up the whole basement and make it more livable. More bearable for me. 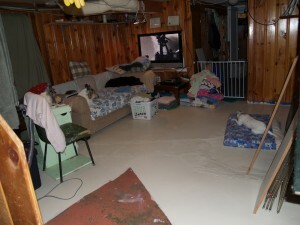 I haven’t spent as much time in the basement TV room for a while because it’s just… icky! So now it’s much nicer. We are even considering painting the ceiling and putting in some more lights. We can’t afford tile, and carpet would just get ruined, so paint it is for now. You can even see Lucy in her chair in the above picture. She is such a good girl and doing really well. I should get a tattoo of her to match my tattoo of Levi. I won’t need tattoo removal because I love my tattoos! That sounds like a big job, but boy it sounds like it will really make everything more cheery!! Hi. I’m visiting you from Grampysworld. Seems like a lesser-of-two-evils situation you have there with your floor. But I think brighter color would be the better option. 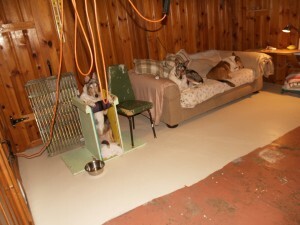 Ah yes, that floor would be much easier to clean once it’s been painted. What kind of paint did you use for the project?